The National Noh Theatre, located in Shibuya-ku in Tokyo, opened in September 1983 (Shōwa 58). With a mission to be a sanctuary of Noh, it stages up to 60 independent performances a year, including ones from all schools, and supports a wide range of activities and studies to spread the art. About 30 people work in the theatre to promote studies of high quality and enthusiastic activities, in addition to supporting performances. Mr Hideya Kawai, the Director of the National Noh Theatre in the Japan Arts Council, leads them in their work. We heard about the many activities of the theatre and his thoughts about spreading Noh. As Director, what do you personally feel every day? I joined the National Theatre about forty years ago, and worked mainly in the administrative office. I started working as a theatre manager rather late in my career, about twenty years ago, when I moved to the National Bunraku Theatre. I was appointed to the post of Director of the National Noh Theatre five years ago. I'm always thinking about the difficulty and responsibilities of theatre management. We have some sixty days of independent programmes. I worry most about how to attract people from all walks of life to the theatre and to fill the house, which has some 630 seats. About 37,000 people come to the theatre annually, and I would like them make their way home savouring happy memories of the performance. After that, I would also like them to look forward to the next programme. I think this is the most important task for the theatre’s workers. We are all doing our best to realise it. Please tell us about the various activities of the National Noh Theatre. The National Noh Theatre is known for its wide range of activities. The main one is to put on independent performances, but we also do other things, including the training of Waki-kata (supporting actors), Hayashi-kata (musicians), and Kyōgen-kata (Kyōgen actors), as well as research, study, and publicity. 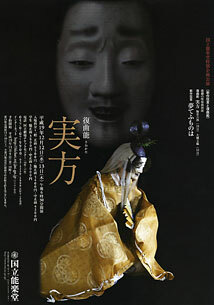 Revival of the Noh play "Sanekata"
What do independent performances consist of? Independent performances are mostly made up of existing traditional plays. Because we run a national theatre, it is important for us to give people an equal chance to see programs by all five schools of Noh and the two of Kyōgen, so staff put their hearts and souls into careful programming. It is not only the selections of the piece, the school, and the performer that are important, but also the sense of season. They must also maintain a good balance among the five categories (God, Man, Woman, Madness, and Demon). The process of programming and booking is a world of troubles. When I go to the meetings, or see the process, I realise they are doing a job that needs care and patience. Meanwhile, we are also engaged in revivals and new productions. For example, on the 12th and 13th of December 2007, we will have a special program featuring a new Kyōgen play, "Yume-chō-monowa" (performed by the Ōkura and the Izumi schools, written by Hoashi Masanori), and a revival of the Noh play "Sanekata" (performed by the Kanze school, written by Nishino Haruo). The Kyōgen piece has been newly written with the dream trade as its unique theme. This is the first new production of the National Noh Theatre for four years. The Noh piece was originally written by Zeami. Master dancer Fujiwara Sanekata plays the leading character. We start revivals and new production projects from in-house planning, and carry out them by requesting scripts and negotiating with performers. We cannot put on such programs every year, but we are trying to do so every several years. We gave the first public performance of "Kurenai-tennyo," which was adapted from a manga (comic book) for young girls by Miuchi Suzue. It has since been performed at a variety of venues. We are planning to produce a commemorative program in 2008, the twenty-fifth anniversary of the theatre, and are currently negotiating with performers about bookings. We are preparing some masterpieces that are not easy to see. I'm sure you're going to love them. The theatre also gives a special program intended for children during the school summer holidays. This photo was taken during the program on 27 July 2007. Please describe the achievements of the training program. Fostering the next generation of performers is another big mission of the National Noh Theatre. In view of the difficult situation regarding independent training for the three key parts (Waki-kata, Hayashi-kata and Kyōgen-kata), the theatre started a six-year training program for them in 1984 (Shōwa 59), the year after our opening. We have turned out some 30 graduates so far, and 25 are now active performers. The early graduates are now in their forties and leading their fields, maturing steadily to support the Noh community. Some graduates have been admitted to the Association for Japanese Noh Plays, which is collectively designated as intangible cultural asset. The trainees do not start practicing until the age of 20, while the sons of Noh performers can have repeated rehearsals from childhood onward. There is a great disparity of training experience between them, but I'm happy to see some graduates have risen to high positions and the program has been successful. We had a special five-day program of Noh masterpieces in June 2007, casting most of the three parts of the plays to our graduates. I was very impressed with them. Because each part of a Noh play is performed by one person, the performers need to have sufficient ability and knowledge to carry out their roles. Therefore, hard training is required. After the training program, graduates also have to practice hard under instructors for some period. It is not an activity that yields quick results, and it could also be a burden for the instructors. I'm very grateful for the passionate efforts of the instructors to support the art. Please outline the Theatre’s research, study and publicity activities. We are creating a library of audio and visual archives of our independent programs, and opening this to the public. Although they cannot be lent out, you can watch archive materials in booths in the reading room. As well as the archive work, we also put a lot of effort into holding exhibitions. Since the opening of the theatre, we have been collecting Noh materials such as masks and costumes, as well as documents and pictures. The collection has become quite large after more than twenty years and is open to public in the exhibition room. We also hold an annual exhibition of important materials from outside of the theatre. Not only do we put these on display, but also we make pictorial records to preserve the valuable data for posterity. 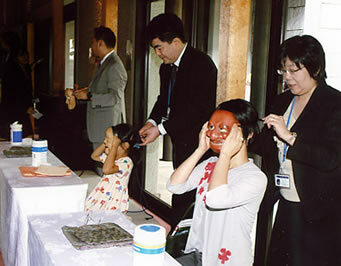 I hope this kind of publicity will attract more people to the Noh theatre in some way. We are currently holding an exhibition of materials from the Takashimaya department store ("Takashimaya Collection - The World of Magnificent Noh Costumes,” 21 Sept to 8 Dec 2007). I will be very happy if people who have not been to the Noh theatre, such as lovers of kimono, become interested in actual stage performances after visiting the exhibition. What do you think is the role or significance of the National Noh Theatre? 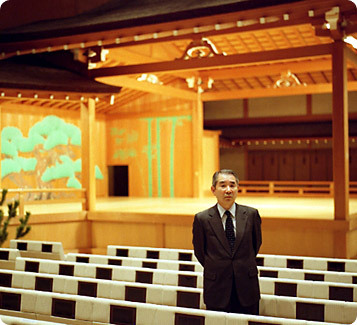 When it opened, there were concerns that the National Noh Theatre might take away the audience of the existing Noh theatres. But I now realise that the theatre has expanded the range of the audience, and made the market bigger. The theatre is not only a venue for our independent programs, but also a public place for hire by people including Noh performers. The occupancy rate is very high, and there are only a few days a month when the theatre is dark. By giving every opportunity for performances, training, research, study, and publicity, as well as by letting out the theatre, I would like the National Noh Theatre to become a centre where people's wishes to develop and expand the world of Noh come together. Please let us hear your thoughts on spreading Noh. I think the only way to spread Noh is a combination of supporting good performances, presenting them to the audience, and promoting better understanding. In order to accomplish this, we have to study every day and consider things from the viewpoint of the audience. I am constantly trying to have discussions with the staff. I think we will quickly find ourselves at a dead end if we lose this viewpoint. If we put ourselves in the place of the audience, we will be able to put on performances they want to watch or that produce pleasant surprises. If people enjoy themselves, you expect them to come back or to visit other Noh theatres. Noh is a traditional performing art with a history of 650 years. I think it is an invaluable fact that such an excellent art was born so long time ago, and even more that our predecessors continued to practice it and to hand it down. I always think it is now our mission to pass on the art of Noh to the next generation. This website is provided with stage photos and pictures from the library of the National Noh Theatre. 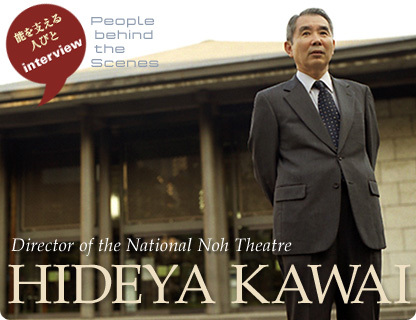 Mr. Kawai joined the National Theatre in 1966 (Shōwa 41) and has worked in several administrative departments, including accounts and general affairs. He moved to the management section of the National Bunraku Theatre in 1985 (Shōwa 60) and was appointed to the post of section chief in 1987 (Shōwa 62). He was consecutively chief of the managing section in the National Noh Theatre and head of the personnel section in the general affairs department of the Japan Arts Council. He moved to the National Theatre to be the chief of the theatre section, the vice director, and the director of the business department consecutively. He was appointed to his present post of Director of the National Noh Theatre in 2002 (Heisei 14).